THE REVIEW: Before Inside Out starts, and even before the wonderful short film “Lava” that plays in front of the feature, director Pete Docter has a brief introduction welcoming the audience to the film. It was quite bizarre and I don’t think I’ve ever seen that happen in front of a theatrical release. Docter talked about how making films allows everyone at Pixar to express their emotions and their personalities. A touching statement, but one I didn’t pay much attention to — I just wanted the movie to start. By the time the end credits rolled however, I saw the benefit of starting with Docter’s introduction: it set the tone for the entire film. 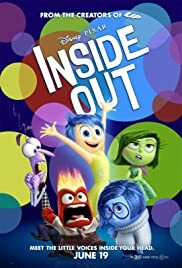 Inside Out features five different emotions of the 11-year-old Riley (Kaitlyn Dias): Joy (Amy Poehler), Sadness (Phyllis Smith, who is perfect in this role I must add), Fear (Bill Hader), Anger (Lewis Black), and Disgust (Mindy Kaling). Through these emotions, you get a look inside Riley’s mind, how daily events are shaped, and what it means to grow up from the perspective of an 11-year-old girl. But the brilliance of Pixar is that they’ve always been able to apply simple ideas and concepts like that to encompass a broader audience and relate to everyone who watches their films. The reason this succeeds with Inside Out is that joy, sadness, fear, anger, and disgust are universal emotions that are present in everyone. True, they’re present to varying degrees in different individuals, but all are present in some form or another. These variations are even seen as you go inside the minds of Riley’s mother (Diane Lane) and father (Kyle MacLachlan), in addition to countless others like a bus driver (where all the emotions are rooted in anger) and my personal favorite the 11-year-old boy who Riley talks to (where red-flashing alarms are going off and his emotions are in a panic, not sure what to do). But even with the main focus on Riley and her emotions, there’s still a lot to take away and connect to. I won’t go into too much detail about how her emotions develop and change over the course of the film (as that would get too spoilery), but suffice it to say, at the end of the film, there’s a balance and friendship between Joy, Sadness, Fear, Anger, and Disgust. And seeing how that balance develops throughout the course of the film is sure to bring up memories from your own childhood, or in the case of parents, memories of their own children growing up and how they changed before their eyes. But the true success of Inside Out is not its ability to bring back personal memories or universal occurrences (like the catchy jingle for the made-up Triple Dent Gum). The true success of Inside Out is that, as Pete Docter explains in the introduction, it is all about emotions and expressing oneself. I’m not going to say that if you don’t cry at least once by the end of Inside Out you don’t have a soul or any emotions. People are inherently different and certain things, in this case a film, don’t have the same impact on everyone who sees it. What I will say is that Inside Out made me cry. You could say it’s the sign of a great Pixar movie like the beginning of Up or the end of Toy Story 3 but I think it’s just a sign of great filmmaking. Any film that can make you cry is a film that leaves a mark on you in a way that watching a typical, large, action-packed, summer blockbuster cannot. It is more personal and more meaningful. For those reasons, it is also harder to explain except to say it’s just what happens. For each person the reasons will probably be slightly different, but for everyone it is because it connects with something below the surface that watching giant dinosaurs or exploding buildings simply cannot capture. THE TAKEAWAY: Pixar has always been able to make films that tug at our heartstrings and create worlds and characters that encourage us to explore our imaginations while still holding on to reality. With so many of their recent films being sequels however, many have argued Pixar is losing its magic1. Inside Out proves that couldn’t be further from the truth. In fact, Inside Out is one of the best films (definitely the most emotional) they have ever made ranking up there with Toy Story, Up, and my personal favorite The Incredibles. Tissues will be nice to have but if you forget them don’t worry too much, everyone around you will probably have brought some. Don’t worry, it’s not all sad and teary; there’s plenty of humor and uplifting moments as well. It really does span the whole gamut of emotions.